The year 2011 started out to be an incredibly good year for Ryan, beginning with light powder days snowboarding at Mammoth and then great surfing and mountain biking adventures with friends and family. Academically, Ryan was excelling at Mission Bay High School: playing football, on the swim team, engaging in community service, and consistently scoring at the top of his academic class. By years end Ryan was awarded Student Athlete of the Year and named Salutatorian of his graduating class. His hard work paid off with several prominent university offers and an academic scholarship. Ryan chose UC Santa Barbara to pursue a major in Physics. As an outdoor person with an outgoing attitude, Ryan settled right into to the UCSB life getting involved in the variety of opportunities the school and area had to offer such as the sailing team, surf team, running and other environmental and school/community organizations. He was loving life. Unfortunately, it was on a trip with the Wakeboard Club, two weeks into the school year that everything changed. 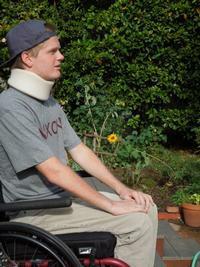 Ryan dove off a dock into a lake and broke his neck. He was paralyzed in his arms and legs. He was life-flighted to Fresno and then San Diego where he underwent two operations and spent two and half months in the hospital recovering and learning to adjust to his new circumstances. The support of friends and family really helped him through those hard times and is greatly appreciated. Ryan is now at home but Occupational and Physical Rehabilitation are still the focus of his days. He has recovered movement and strength in his arms, some in his hands and just recently has occasional movement in his legs and toes. Insurance covers some of Ryan’s therapy sessions and equipment needs but additional funds are needed to help pay for the extra therapy and equipment needed to promote and accelerate his continued recovery. To assist with these expenses, a fundraising campaign in Ryan’s honor has been established with HelpHOPELive (formerly NTAF), a nonprofit organization that has been assisting the transplant community for nearly 30 years. In 2000, they expanded their mission to include those who have sustained a catastrophic injury. All contributions are tax deductible, are held by HelpHOPELive in the Southwest Spinal Cord Injury Fund, and are administered by HelpHOPELive for injury-related expenses only. Please consider making a donation:Please help support Ryan in his hope to walk again and return to UCSB and his active lifestyle. Thank you! Update on Ryan. 5 days a week Physical Therapy 2 days Project Walk(4 hour sessions), 2 days Sharp, 1 day Awakenings(FES Bike, Acupuncture) Workouts at home. Sailing and swimming once a week. Taking 2 online classes covering college GE requirements. Presently able to walk 200ft with a walker.He keeps making progress. We are so thankful. Thank you to everyone for all your support!